Please contact me if you wish to discuss how I can help your baby or child. 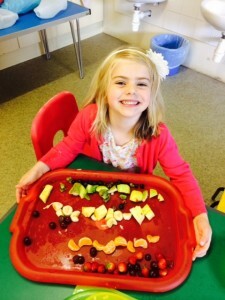 Helping preschool and reception children to love healthy food! 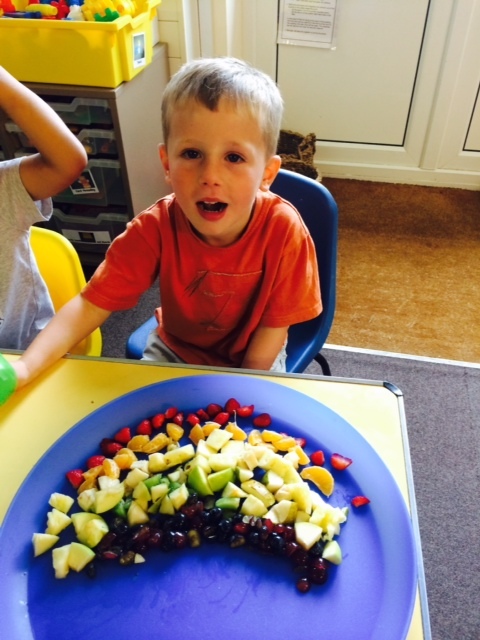 There is nothing more rewarding than seeing a group of children engaging with and enjoying healthy food. This is the aim of our Nourishing Children’s Workshops designed for preschool and key stage 1 school children. These sessions are fully interactive and can be designed with your objectives in mind. 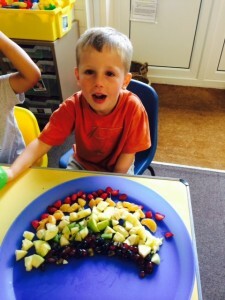 Our aim is to get children involved in preparing and eating healthy food and in trying new flavours so they go home to their parents that evening excited and informed about how what we eat can make us healthier. What we often discover is that children are much more likely to adventurous when they are surrounded by all their friends eating a food than at home and that they are more easily encouraged to eat healthy foods when they know how they help their bodies for example, helping their bones grow, their teeth strong, giving them energy to run and play. 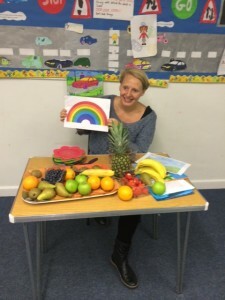 These fun sessions are about teaching the importance of healthy eating in a memorable way and in particular the health benefits of different fruit and vegetables and how eating ‘a rainbow’ of fruit and vegetables every day is fun, healthy and tasty. Children are provided with certificates for taking part and reward charts to take home so they keep up the good work with their families! “Laila engaged all the children instantly with her warm friendly personality. She differentiated the talk so that all the children, no matter what age they were understood and had full involvement through out. She explained all about healthy eating and healthy lifestyle choices, assisting the children with cutting fruits, whilst encouraging them to describe the characteristics of each piece. 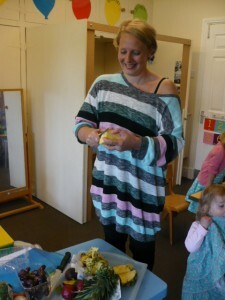 Laila is a breathe of fresh air and both the children and staff adored her session” Jemma Scarrot – Pip n Jims Preschool leader. 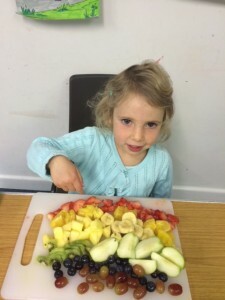 “I was surprised when Heidi said she had eaten kiwi fruit and pineapple at preschool in a fruit salad as she normally won’t try new foods at all“ Mother of Heidi, aged 3. After having some tests, making small changes to my diet and taking supplements my respiratory symptoms were better than they had been in 15 years and as an added bonus my skin looked fantastic.